Below are Box Office Collection Report of bollywood film 'Bareilly Ki Barfi' With his review, budget and total box office and worldwide collection status. Bareilly Ki Barfi movie lead star cast is Ayushmann Khurrana, Kriti Sanon. 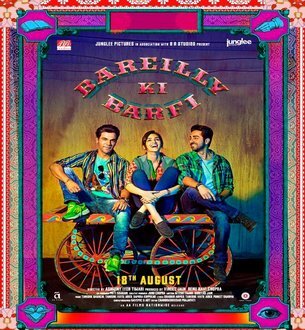 Bareilly Ki Barfi is an indian Comedy, Romantic Film of 2017, directed by Ashwiny Iyer Tiwari & produced by Juno Chopra, Renu Chopra. Bareilly Ki Barfi film Released in over 900-1000 screens in India. The small town romantic comedy, starring Ayushmann Khurrana, Kriti Sanon and Rajkummar Rao, has garnered Rs 2.42 crore on Day 1 and Rs 3.85 crore on 2nd day at the box office. Storyline:- Bitti Mishra (Kriti) is a bohemian Bareilly girl who falls deeply in love with Pritam Vidrohi(Rajkummar) an author because she admires his progressive way of thinking. Finding him though proves to be as hard as looking for a needle in the haystack. So Bitti seeks the help of the local printing press-owner, Chirag Dubey (Ayushmann) on her journey of love.